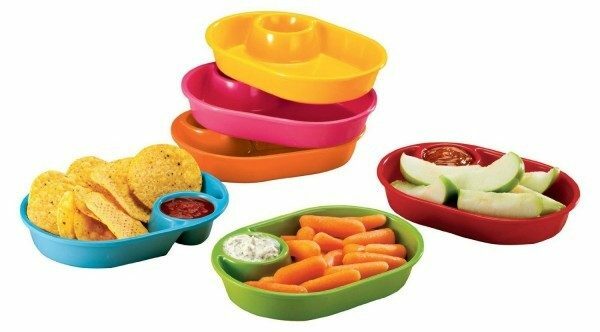 Set of 6 Chip and Dip Individual Serving Dishes Only $9.99! You are here: Home / Great Deals / Amazon Deals / Set of 6 Chip and Dip Individual Serving Dishes Only $9.99! Oh my goodness, I am LOVING this deal! Right now, you can get this set of 6 Chip and Dip Individual Serving Dishes for just $9.99 (reg. $29.95)! That’s only $1.67 each! And, shipping is FREE with Amazon Prime or Super Saver Shipping! I LOVE this idea! This sure would make snack time much easier – everyone with their own chips and dip rather than reaching into the bag constantly! It’s also a great way to portion snacks so you don’t over eat. 7″L x 5″W x 1″D. Dishwasher-safe, durable melamine.